Another 74 wins & 74 nominations. This is one of the greatest movies ever made. To think that this movie did not win Best Picture is a crime. Director Steven Spielberg uses all of his talent and resources to give to the world the greatest war film ever made. Though it's true that this is not the type of movie you want to sit down with the family and eat popcorn, the emotional drive of the picture, the story's poignant messages, and the fantastic acting of the cast draws you into a world that is both dangerous and unpredictable. Spielberg is able to take you into action and make you feel as if you are a participant in the movie and not just a viewer. This is Tom Hanks' best movie he ever did. Forget his performances in Philadelphia and Forrest Gump (though they were also good); he should have received another Oscar for the role of Capt. John Miller, a leader who must act strong in front of his men, but must also hide his emotions from them. It would have been well-deserved if he won again. I give this movie my highest recommendation. 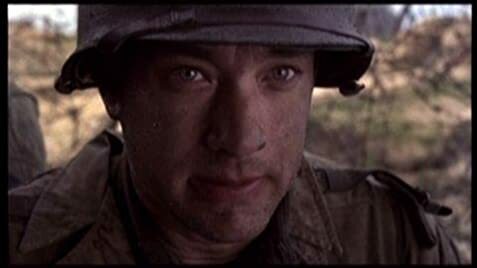 Saving Private Ryan is a movie that makes you realize how life is precious and how honor and duty, though they are deep philosophical concepts that are praised in war, can put you in jeopardy of losing your life for something you may not believe in. Clifton Collins, Jr. was a finalist for the role of Upham. LCVP pilot: CLEAR THE RAMP! THIRTY SECONDS! GOD BE WITH YA! When Jackson has been given the dog tags to search through he looks for a place to sit. In this scene you see a black box with two yellow boxes at either side in the background. In the next scene the yellow box on the left has magically jumped up onto the black box in order for Jackson to kick it off and sit on it. The DreamWorks and Paramount logos play in complete silence. In the German-dubbed version of the movie, they were unsure how to distinguish dialog between the German and the American soldiers, since they would all be speaking German. In the end, they decided to address all the American soldiers by their English titles, such as "Sergeant" and "Captain".